My first daughter has lovely slim feet, and can literally wear any kind of shoe. She has quite the collection in-fact. So when I found out I was having another girl I was pleased to think that these could then be handed down. It made me feel a lot less guilty for all those purchases. However, when Evelyn was fitted for her first pair of shoes I was gutted to discover that her feet were going to be far to wide for any of her sisters beautiful hand-me-downs. Nevermind I thought, that’s a good excuse for me to invest in her very own shoe collection. Little did I know that it would be literally IMPOSSIBLE to find anything remotely stylish in a G width. Unless I wanted to spend upwards of £70. Literally the only brand worth considering has been Startrite. 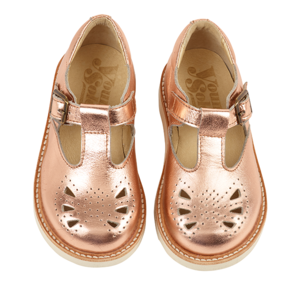 In fact I think I can conclude from my endless internet searches, and visits to children’s shoes shops, that in-fact Startrite shoes, and Clarks, are the ONLY offering when it comes to wide-fitting children’s shoes. And even then it is very limited. (I hate anything with sequins, or butterflys, or a babyish pattern.) No other brands seem to even address the width issue with their designs. They only offer one size? Why?! From exploring various mum blogs and forums I can see that there are literally thousands of parents desperate for wide fitting children’s shoes, that are actually nice, and also affordable. I’m talking £30-£40 max. There are beautiful brands such a Young Soles London but the prices, for me, and I would like to say the majority of parents, are just too steep. Not when they will no longer fit after six months.